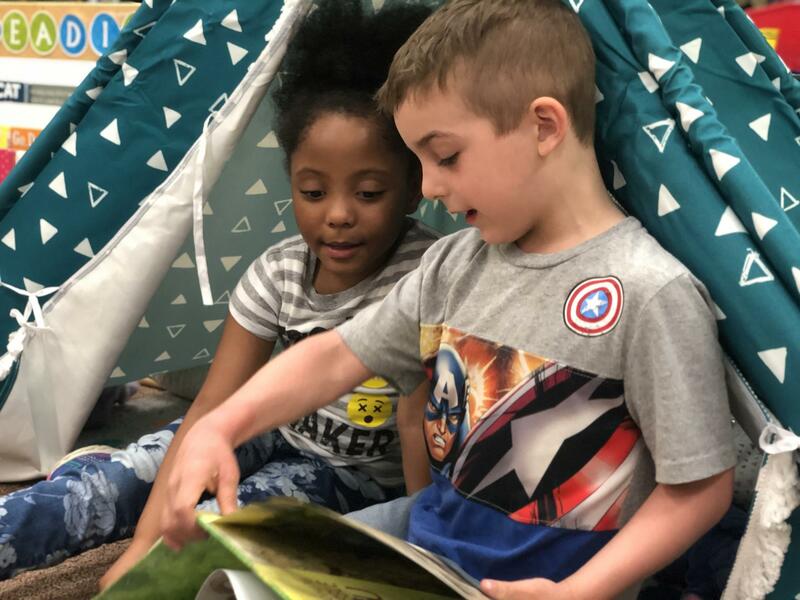 Students in Julia Meyer's kindergarten class at Pitcher Elementary practice reading to each other. 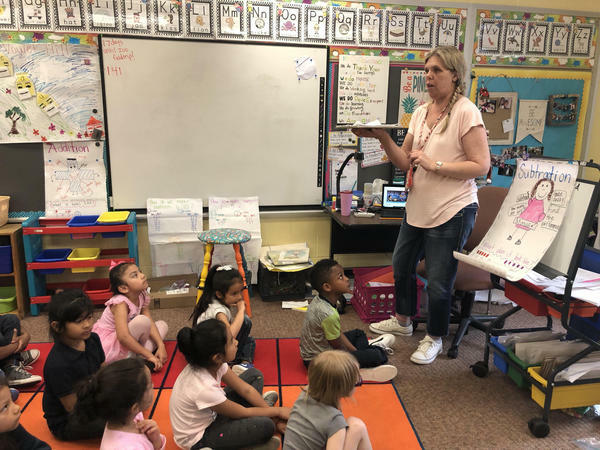 There were 307 students enrolled at Pitcher Elementary on the last day of school, but that number doesn’t tell the whole story. 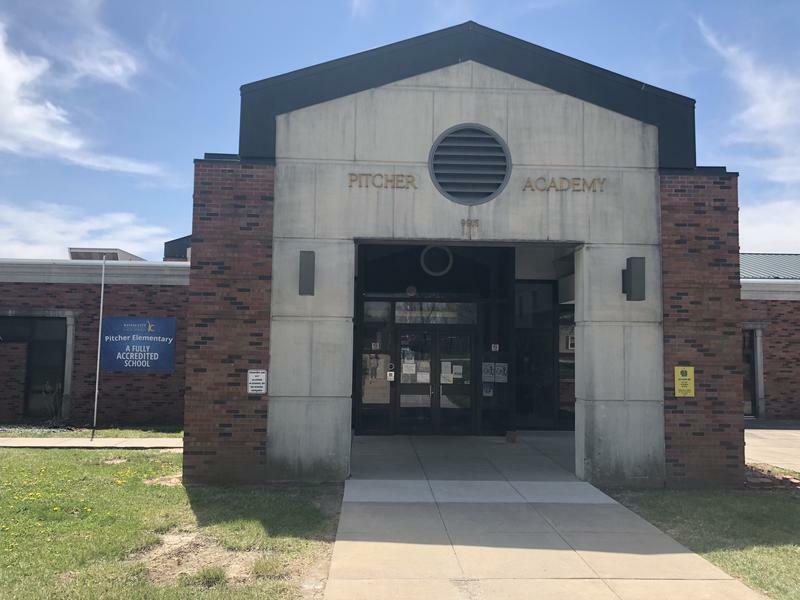 Pitcher is about as far east as a school can be and still be in the Kansas City Public Schools – out by the stadiums, mere blocks from the Independence and Raytown districts. Kids come and go constantly as their families’ circumstances change. Over the course of the school year, 194 kids moved in or out of Pitcher. Most arrive with gaps in their education that make it hard for them to meet grade level expectations, especially in reading. Howard pulls up the roster for one third grade class. Students switching schools mid-year isn’t just a problem at Pitcher or in the Kansas City Public Schools. It’s an issue citywide. As KCUR has reported, students who move around a lot end up falling behind their more stable peers. This transience frustrates educators who feel they barely get a chance to teach some students before they’re on the go again. It also undermines school improvement efforts. But at Pitcher, a bright blue banner outside the brick building proclaims it’s a fully accredited school. (The district as a whole is provisionally accredited.) Teachers and tutors have developed strategies to teach kids who will likely only be there for a short time. Before third grade, it’s said students are learning to read, and after third grade, they’re reading to learn. Students who aren’t reading on grade level by third grade end up falling further and further behind because they can’t access the texts that teach them everything else. That’s why there’s been a big push in recent years to improve the literacy of Kansas City kids. Principal Howard used to give new students a computer test when they transferred to Pitcher in the middle of the year. But last summer, she was reading a book on reading, and in the back, there were quick, 5-minute tests to assess phonemic awareness. Phonemic awareness is how you teach a child to read, by recognizing the small sounds that make up words. Howard swears by small group instruction. Two years ago, Pitcher got a school improvement grant from the Kauffman Foundation. Howard used the money to convert the school’s textbook storage room into the Learning Lab. All day long kids rotate in and out of the Learning Lab in groups of five or six, getting really individualized instruction from tutors. 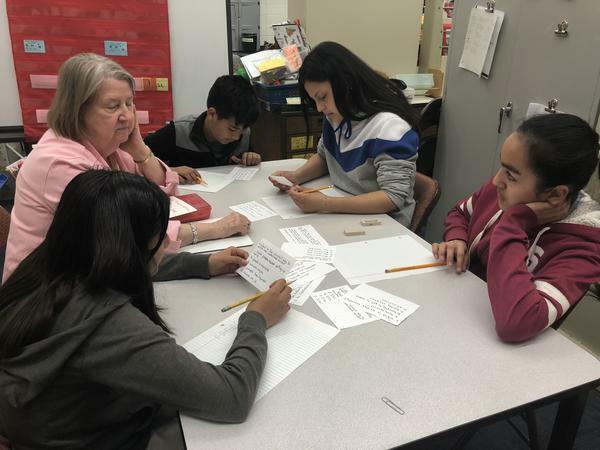 Karen Gruber is working with sixth graders who speak Spanish at home. Gruber actually retired from Pitcher a couple of years ago, but Howard convinced her to come back as a tutor. Howard really likes to hire retired teachers because they already know how to work with the kids. With the $72,000 Howard pays the six Learning Lab tutors, she could’ve hired a full-time reading specialist. That’s what a lot of schools do when they have a little extra money to put toward improving student achievement. But a reading specialist, however good, is still one person. Kindergarten teacher Julia Meyer says the best part of her job is teaching reading. She loves watching the light bulb go off when they figure out that C-A-T is cat and D-O-G is dog. 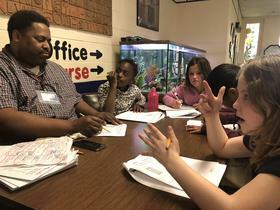 Teachers at Pitcher also use small groups in their classrooms so they can spend more time one-on-one with students who need extra help, a strategy known as flexible grouping. Meyer gets one group playing a computer reading game and another group working on review packets. Several students go over to the classroom library and pick out books to read in pairs. That frees Meyer up to work with students who are beginning to write sentences. A blend is when two letters together make one sound. The students knows that S - H makes the sound shh even though Meyer hasn’t taught that yet. Figuring out what students who transfer in already know is an ongoing challenge at Pitcher. In kindergarten, it’s pretty common to teach a letter a week first semester. A new student might come in knowing the letter that Meyer’s teaching that week but not know any of the letters she’s already taught. Mid-year assessments help track Pitcher students’ progress. 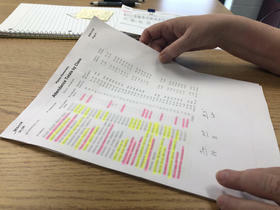 These tests, administered in September and January, aren’t used to determine school accreditation. But they can tell principals if their interventions are working. Here’s how to read the results of those assessments: the diamond in the middle of each bar predicts academic growth, or how much progress you’d expect a typical student to make in four months. The bars measure how much Pitcher students actually grew. “And you can see they exceeded the expectations greatly,” Howard says. Mike English is the executive director of Turn the Page KC, a nonprofit that tries to get as many Kansas City kids reading on grade level by third grade as possible. He says bringing in retired teachers is a good strategy. 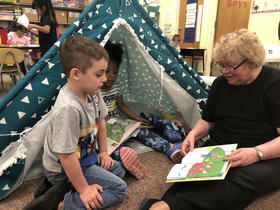 “They’ve been trained to teach and they’ve done it, but it also provides more teachers in the classroom to work with those smaller groups,” English says. There’s another benefit: having lots of tutors puts more adults who care about kids in the building. Having extra staff to welcome new students helps. Next year, though, Howard won’t have money to pay for tutors.